Santiago Palavecino is a young Argentinian director that his style and films subsume him to the new Argentinian cinema that has evolved during the last decade. His first feature film was Otra Vuelta (2005) and since then he has presented his work in many international film festivals. Algunas Chicas (Some Girls) is his fourth feature film and has participated in Orizzonti section of the 70th Venice Film Festival. Celina (Cecilia Rainero) is a surgeon; she is married and lives in Buenos Aires. She decides unexpectedly to leave her husband and travel in order to meet Delfina, her old friend from the university. Delfina (Agustina Liendo) is married to a wealthy widower, Sergio (Alan Pauls) and lives in a small town with him and his teenage daughter Paula (Agostina López). When Celina arrives, Paula is missing and she randomly meets her friends Nené and Maria. Nené (Ailín Salas) is the only one who knows Paula and her attempt to commit suicide by cutting herself. Her mystic witchlike appearance and her prophetic thoughts scare a bit Celina. On the other hand Maria (Agustina Muñoz), a young widow and heiress of a big fortune, she lives a boring life and she needs some action and some daily adventures. When Paula appears again, Celina has already been a member of their odd group and together they will try to escape from everyone and everything. Algunas Chicas is a rather obscure and off beat thriller. Palavecino who is also the screenwriter follows a quite linear narration for the beginning of the film which includes moments of true agony and mystery. When the story starts to unfold, the elements of mystery tend to diminish and the film evolves to a feminine psychodrama. During that process, Palavecino works again with his preferred dream-like scenes where everything gets mixed up. The whole story presents contemporarily bits of dream and reality that are confusing and are making difficult to discriminate what is really happening. The only key location for both worlds is a swimming pool. Through that water, the director tries to have a deep plunge into the female psychosynthesis. His protagonists are all troubled, unsatisfied, trapped girls who, one way or another, are trying to escape from their individual realities. But at the same time they seem incapable to free themselves, so they are confined to small getaways. Drugs, sexual experimentation, swimming, parties and shooting riffles are some of their guilty pleasures. The reality is unbearable for Some Girls, and even their dreams seem somehow connected and haunted like vivid nightmares. Water and blood are always the elements presented in every scene; they both offer a different freedom. A herd of wild horses is also appearing during the key moments probably as another symbolism of freedom and independence. Palavecino’s Chicas seem so depressed, powerless, alone and desperate, they feel that they don’t belong to this world anymore. Some of them prefer to create their one fake reality and others that are not so strong are feeling that death could be their only true escape. When you stay somewhere, whether this is a place or a situation, that becomes your home and then you should leave, you always have to leave from your home. In Algunas Chicas, the director expands his cinematic language without forgetting his significant elements that where obvious from his previous works. It seems that death-related dreamlike experimental films are trending in Argentina; we should remember that last year Orizzonti hosted Leones by Jazmín López. Of course Palavecino is not trying to be extremely experimental; he is keeping his story and his direction closer to reality with some particles of fantasy. The hand-held camera gives that impression especially when it is following Cecilia Rainero through all her troubled phases. 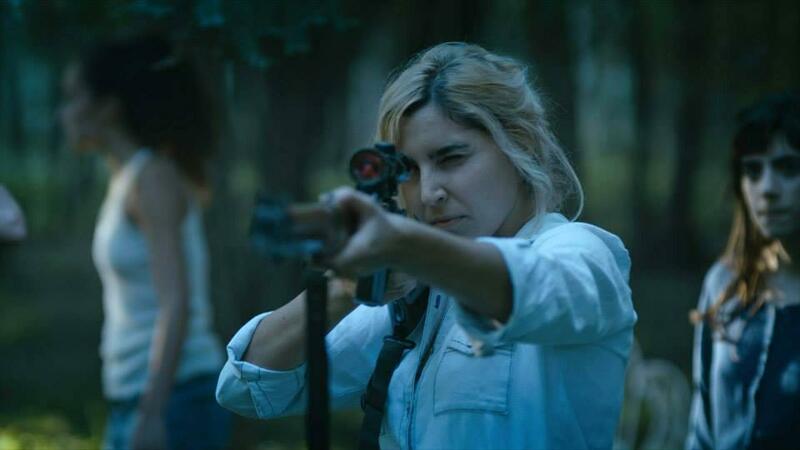 Agustina Muñoz neurotic but at the same time cold and firm performance gives a different edge to the film without trespassing the presence of the others. According to Palavecino, Algunas Chicas is a film that tries to explore the female depression and how a woman can cope with that crisis. In a way he achieves to touch such a sensitive issue but somehow he doesn’t explore all the open issues at the level that is needed so the result is slightly uneven. It is of course a very interesting attempt from a male perspective but in the end he is not driving his search to the deepest end.